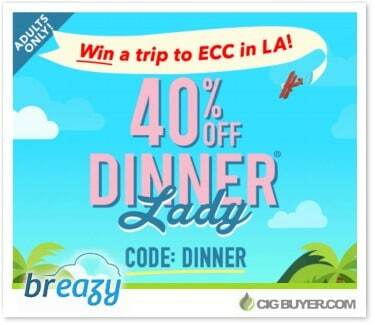 Breazy.com regularly offers discounts on entire categories of e-juice, but this deal applies just one brand (one of the most popular over the past year!) – Dinner Lady. Until January 24th you can save 40%, which reduces 60ml bottles to only $13.19. Recently recommended as one of our “Best E-Juice Brands to Try in 2018,” Dinner Lady E-Liquid has won numerous awards and is widely-known for their outstanding dessert flavors. You have 7 different options to choose from, including: Apple Pie, Blackberry Crumble, Corn Flake Tart, Lemon Tart, Orange Tart, Rice Pudding and Strawberry Custard. * This special Breazy.com E-Juice Sale ends on January 24, 2018.